What a way to end the year! Barely eight days to go before we hit Kolkata. The littlest sister, aka pint-sized princess is getting married. Cue a small Indian wedding for 400 of her closest friends and family. Truth be told, she really is my first child. I have enjoyed honing my fine parenting skills on her. Perfecting the naughty corner method. Doling much unwanted advice. Oh, and mercilessly insisting she learn to cook Indian food in expletive-ridden sessions. It didn't take long for her to wreak havoc in my life. For as long as I can remember, she called me mini mummy. Not great in the playground. And she ruined my 14th Birthday by hogging the attention of ALL teenage boys, travelling from knee to knee as a five year old. This four-day extravaganza is going to be like nothing else. But in the meantime, its two days to Christmas. I have my body weight in Brussels Sprouts, four birds in one and best of all, the man to cook it all. Food coma here we come. The kids have dressed the tree entirely on the bottom rungs, and if Santa doesn't deliver a pirate ship and a Barbie castle, he is a dead man. I have been relegated to cooking deserts and potatoes mostly. And the one thing I have perfected after several goes this season are the best saffron roast potatoes. 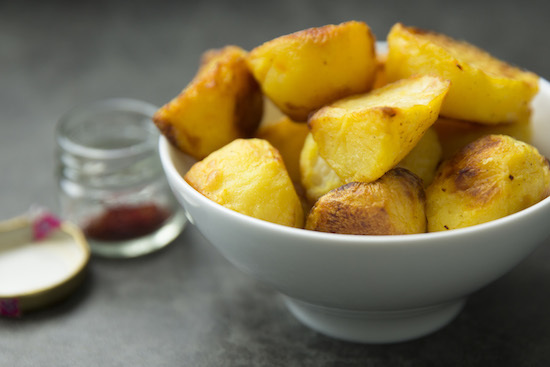 If you fancy a twist on your Christmas roast potatoes, this recipe is the one to try. My tip is to soak the saffron in warm milk first so you get a really delicate, rounded flavour rather than some pitatoes spiked with strands and not others. And sunflower or vegetable oil is a must for crispy edges. Have a happy, happy end to the year, a great start to the next and see you on the other side! Peel and quarter the potatoes and then place them in a large pot filled with cold water. Bring the potatoes to boil, and let them bubble for about five minutes just until the edges turn translucent. In the meantime, warm the milk and steep the turmeric and saffron in it. Oh, and pre-heat the oven to 200 Degrees Centigrade. Next, drain the potatoes (I always save the potato water for gravy/soup), and tip back into the large pot. stir the oil, golden milk, salt into the potatoes, cover the pot and shake it as violently as possible without causing any spillage. This roughs up the edge giving you the to-die-for, all crispy edges. Place on a foil covered baking tray and bake for an hour until golden. I find baking them on their rounded sides and stirring once through cooking really helps create crispy bits. Enjoy as a side with a full roast, or anything you fancy really. The taters look good, must try. Have a great Christmas with your family, eat drink and be very very merry…..hic. Nice read! I never came across such unique potato recipe, certainly on my list. They look really delicious. Thank you for sharing your personal story and step by step recipe of saffron roast potatoes. Really liked reading it. For more such recipe, check out the website of iChef.